We have a real, coming broadband access crisis in the United States. Data from the government and independent analysis show that we are falling behind the world. This crisis comes from the fact that fiber-to-the-home deployment, the alternative to your gigabit cable monopoly (if you even have that choice), is languishing and slowing down across the board. In contrast to the United States, countries around the world are aggressively modernizing their telecommunications infrastructure. They are actively pushing fiber across the board, with advanced Asian markets like South Korea and Japan already finished, and countries in the EU heading towards universal access (including their rural markets). China is predicted to have more than five times (around 80 percent of households totaling at 193.5 million homes) the U.S. number of fiber gigabit connections by 2023. The big difference between the United States and the rest of the advanced economies around the world is that the U.S. is the only country that believes having no plan will solve this issue. We are the only country to completely abandon federal oversight of an uncompetitive, highly concentrated market that sells critical services to all people, yet we expect widely available, affordable, ultra-fast services. But if you live in a low-income neighborhood or in a rural market today, you know very well this is not working and the status quo is going to cement in your local broadband options to either one choice or no choice. Congress and the FCC have been obsessing about 5G hype, but early estimates are that only about three to nine percent of the market will have 5G access by 2022. It’s important to remember that, no matter what ISPs try to say about 5G, there is no real equivalency between fiber to the home and wireless 5G broadband. The two are not direct competitors given the superiority of fiber as a transmission medium. The less-spoken truth about 5G networks is that they need dense fiber networks to make them work. One estimate on the amount of fiber investment that needs to occur is as much as $150 billion—including fiber to the home deployments—in the near future, and we are far below that level of commitment to fiber. In other words, resolving the future of high-speed broadband competition with fiber to all Americans (which would help at least 68 million households stuck in monopoly cable markers) also carries the benefit of ensuring that 5G networks can reach all corners of the country as well. 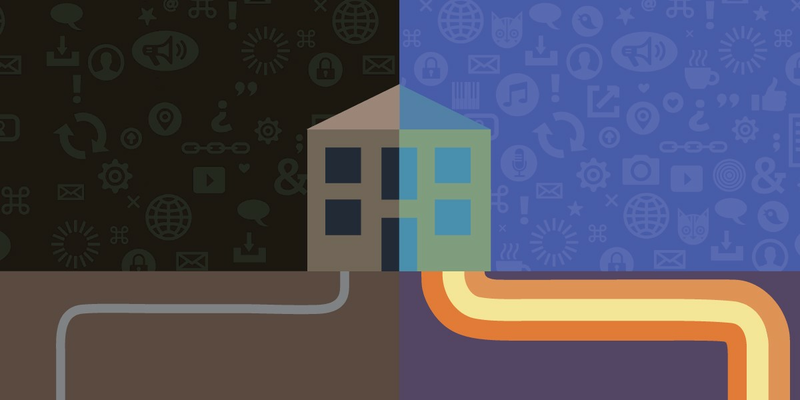 Very small ISPs and local governments with limited budgets are at the frontline of deploying fiber to the home to fix these problems, but policymakers from the federal, state, and local level need to step up and lead. At least 19 states still have laws that prohibit local governments from deploying community broadband projects. Worst yet, both AT&T and Verizon are actively asking the FCC to make it even harder for small private ISPs to deploy fiber, so that the big incumbents can raise prices and suppress competition, a proposal EFF has urged the FCC to reject. This is why we need to push our elected officials and regulators for a fiber-for-all-people plan to ensure everyone can obtain the next generation of broadband access. Otherwise, the next generation of applications and services won’t be usable in most of the United States. They will be built instead for markets with better, faster, cheaper, and more accessible broadband. This dire outcome was the central thesis to a recently published book by Professor Susan Crawford (appropriately named Fiber) and EFF agrees with its findings. If American policymakers do not remedy the failings in the US market and actively pursue ways to drive fiber deployment with the goal of universal coverage, then a staggering number of Americans will miss out on the latest innovations that will occur on the Internet because it will be inaccessible or too expensive. As a result, we will see a worsening of the digital divide as advances in virtual reality, cloud computing, gaming, education, and things we have not invented yet are going to carry a monopoly price tag for a majority of us—or just not be accessible here. This does not have to be so, but it requires federal, state, and local governments to get to work on policies that promote fiber infrastructure to all people. Your landlord is prohibited from making deals that restrict you to a single video provider, and those prohibitions should apply to your broadband service as well. Yet, across the country, tenants remain locked into a single choice.